Windows 10 is one of the best products by Microsoft. It has a myriad of amazing features which remain unexplored as the conventional user has no idea about them or how to access them. One such remarkable feature is its ability to generate Wi-Fi history or WLAN report. This built-in functionality allows the users to easily access their Wi-Fi connections. The history report is created using information such as the network name, session duration, and timing, etc. With this incredible report generating feature, you can monitor your Wi-Fi’s internet usage, devices connected to it, the location of access by connected devices and the number of times the Wi-Fi connection was used. In this tutorial, we will be covering all the steps that are required to generate this report. The System Section: This contains your computer’s general information. The User Section: This includes information such as the username and domain name. The Network Adapters Section: This has the list of adapters present on your computer whether physical or virtual. Step 1: Open the Command Prompt: Go to the Start Menu and type ‘cmd’. You will see Command Prompt in the list, right-click on it and select ‘Run as Administrator’. A ‘User Access Control’ window will appear asking for access. Click on ‘Yes’ and a window with ‘Administrator: Command Prompt’ label will open. Step 3: Press the ‘Enter’ key. 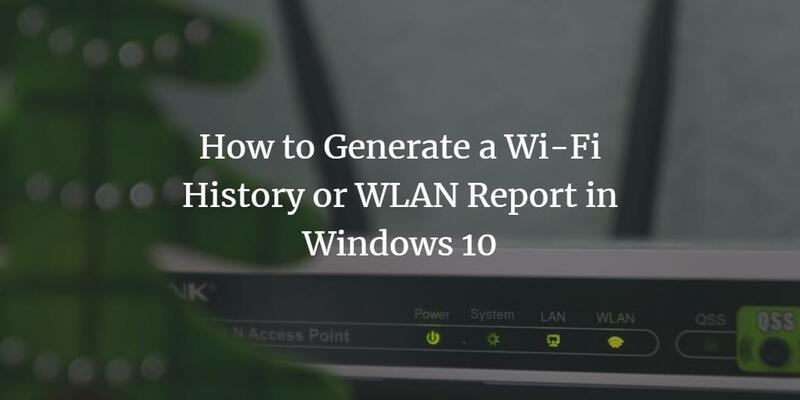 The HTML form of the history report will be saved automatically in the WlanReport folder of your Windows 10 with the name ‘wlan-report-latest.html’. You can view this report in any browser such as Edge, Safari, Chrome, and Firefox. Step 5: Click on the report and view it on any web browser. With these easy steps, you will be able to easily monitor and analyze your Wi-Fi usage with the help of an interactive report that provides additional information on cursor’s hover. Is it possible to get a report older than 3 days ? does windows keep a log of all connections ?